John Pletcher was born on May 26, 1945, in Ohio. He entered the U.S. Air Force Academy in June 1963, and was commissioned a 2d Lt in the U.S. Air Force on June 7, 1967. Lt Pletcher next received an Air Force Institute of Technology assignment to complete his master's degree in mechanical and aerospace engineering at Illinois Institute of Technology from September 1967 to March 1969, followed by Undergraduate Pilot Training at Randolph AFB, Texas, from March 1969 to March 1970. After completing C-130 Hercules Combat Crew Training and other training he served as an HC-130P pilot with the 39th Aerospace Rescue and Recovery Squadron at Cam Ranh Bay AB, South Vietnam, from August 1970 to August 1971. During this time Capt Pletcher served as pilot of the HC-130P "Lime Two" during the Son Tay Raid, a clandestine mission to rescue American Prisoners of War in North Vietnam on November 21, 1970. His next assignment was as an HC-130P pilot with the 76th Aerospace Rescue and Recovery Squadron at Hickam AFB, Hawaii, from September 1971 to September 1974, followed by service as Air Operations Officer for the 41st Aerospace Rescue and Recovery Wing at Hickam from September 1974 to June 1975. Capt Pletcher then received another Air Force Institute of Technology assignment, this time to complete his Doctorate in mechanical and aerospace engineering at Wright-Patterson AFB, Ohio, from June 1975 to August 1978. 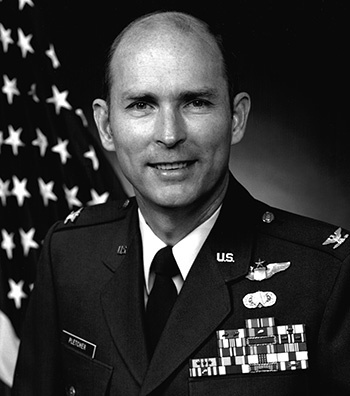 His next assignment was as an instructor, course director, Associate Professor of Aeronautics, and then Director of Academic Operations at the U.S. Air Force Academy from August 1978 to June 1982, followed by service as Chief Flight Systems Engineer for Special Projects, Chief Systems Engineer for Special Projects, F-15 Chief Systems Engineer, and Maverick Chief Systems Engineer with the Aeronautical Systems Division at Wright-Patterson AFB from July 1982 to April 1985. LtCol Pletcher served as Commander of the Frank J. Seiler Research Laboratory at the U.S. Air Force Academy from April 1985 to June 1987, and then as a Research Fellow at the Industrial College of the Armed Forces from July 1987 to June 1988. Next he was Program Manager for the Strategic Defense System Program Elements and Assistant Deputy for Engineering with the Strategic Defense Initiative Organization at the Pentagon from July 1988 to September 1990. Col Pletcher next served as Director of the Armament Directorate at Wright Laboratory with the Aeronautical Systems Center at Eglin AFB, Florida, from November 1990 to August 1994, followed by service as Commander of the European Office of Aerospace Research and Development in the Air Force Office of Scientific Research in London, England, from August 1994 until his retirement from the Air Force on July 1, 1997. After retiring from the Air Force, Dr. Pletcher worked for several years as a project manager and technical advisor for Department of Defense contractors and later directly as a civil servant for the Department of the Air Force at the Air Armament Center. He was promoted to Senior Executive Service (one-star civilian equivalent) and served as Associate Director for Weapons at the Air Force Research Laboratory at Eglin AFB from December 2004 to August 2008. Currently he is serving as Distinguished Visiting Professor of Aeronautical and Systems Engineering at the US Air Force Academy in Colorado. Captain John H. Pletcher, Jr. distinguished himself by extraordinary achievement while participating in aerial flight as a Copilot aboard an HC-130P aircraft over hostile territory in Southeast Asia on 18 April 1971. On that date, Captain Pletcher skillfully coordinated and controlled the efforts of twenty-two strike aircraft in the immediate vicinity of a downed pilot while under the constant threat of hostile fire from numerous antiaircraft artillery positions in the area. His superior resourcefulness and positive command and control of these resources involved in this difficult and challenging combat aircrew recovery effort led to the successful rescue of the pilot from certain capture and possible death at the hands of hostile forces. The professional competence, aerial skill and devotion to duty displayed by Captain Pletcher reflect great credit upon himself and the United States Air Force.